"The people in charge can always justify doing terrible things in the name of the greater good." Over the years, I've become a fan of Joe Hill. His early works, 20th Century Ghost Stories and Horns showed that the young author's imagination could conjure characters and scenarios that were as thought provoking as they were entertaining. I enjoyed his last novel NOS4A2, a genre-bending throwback to the kind of novels that his father is famous for producing, so much, that I was ready to devour anything he could come up with next. The Fireman is a sprawling story written by an author who has full control of his craft. In the novel, Hill imagines a world that is riddled with a plague. The mysterious Dragonscale first emerges as a topical affliction that causes dark marks to appear on infected peoples' skin. Eventually the infected spontaneously combust. The disease is highly contagious and spreads like wildfire. Harper Grayson, an elementary school nurse who models herself after Mary Poppins, first encounters the disease at her school. As the book opens, she witnesses one of the infected men burst into flames on the school playground. Clearly, this is no Disney movie. Months later, the disease has evolved into a full on epidemic. Harper finds herself volunteering at the local hospital when a disturbance in the line of infected people waiting to be admitted arises. A fireman dressed in full uniform is holding a small boy and demanding that a doctor see them immediately. Harper steps in to bring order to the situation and to try to help the child in any way that she can. Who is this mysterious fireman and why is he holding this child? I won't go into much more about the plot, and I would urge you to try to go into the story as blind as possible. With the main focus being Harper Grayson's dealing with the epidemic, The Fireman becomes one woman's tale of survival against all odds. As she faces the horrible reality of a world engulfed in disease and flames, Harper attempts to maintain her morality and personal safety. Joe Hill's latest novel reminds me why I have enjoyed his previous works so much. He populates the book with imaginative characters whose evolution serves as the book's primary propulsion. At over 700 pages, The Fireman can drag on at times, but the slow burning suspense that permeates the book helped to keep me reading. Echoes Bradbury and Orwell fill the crevices of this tale with cautionary revelations and warnings that are inevitable in a book of this nature. Somehow the book left me wanting something more and equally wishing it had been a bit shorter. Even if the story overstays its welcome, The Fireman is a solid effort by Hill that easily cements his well-deserved place on our bookshelf. This entry was posted on Wednesday, April 12, 2017 and is filed under Book Review,Fiction,Joe Hill,N0S4A2,Ray Bradbury,Stephen King,The Fireman. You can follow any responses to this entry through the RSS 2.0. You can leave a response. I read this recently! I've also read his NOS4A2 and I loved them both. This one had some great, gory mental imagery. Talk about creepy. I also loved how the cure seemed to evolve (devolve?) into cultlike behavior. There's definitely some gore! I really liked the idea of them coming together for "the Bright". I grabbed this on audio after devouring NOS4A2 and you reminded me why. LOL, I didn't even read the synopsis so I appreciate your vagueness on the storyline. You definitely want to go in blind and just experience it for yourself. 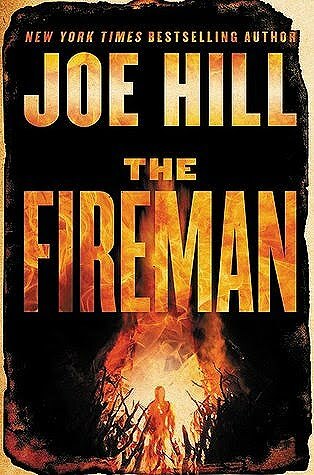 I've been meaning to read something by Joe Hill for a long time, I might just pick this up! Great review. Thank you for sharing! I'd recommend NOS4A2 as an introduction! Ok then... I added NOS4A2 to my tbr list! Thank you.